A Polish Jewish soldier who was killed in the battle near Moscow, in the Polish war against Russia in 1610. He was the son of Aaron ha-Ḳadosh ("The Martyr") of Tishovitz (probably Tyshovtzy, government of Lublin), and served in the cavalry, "on three horses." 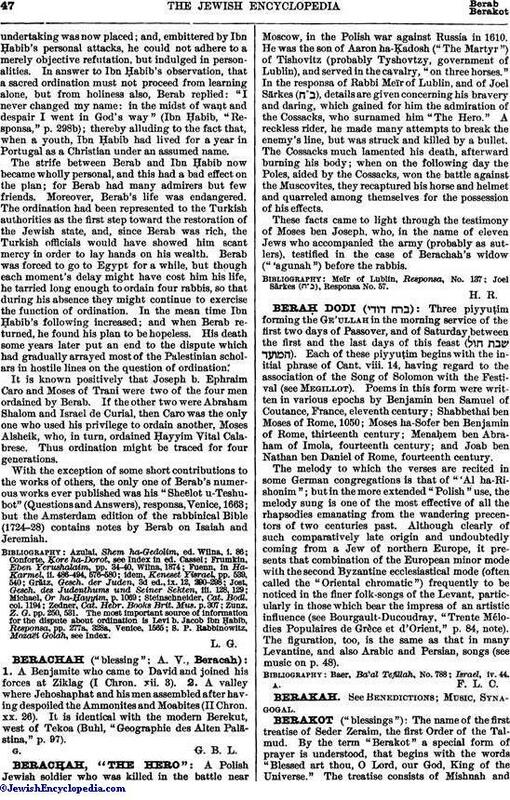 In the responsa of Rabbi Meïr of Lublin, and of Joel Särkes ( ), details are given concerning his bravery and daring, which gained for him the admiration of the Cossacks, who surnamed him "The Hero." A reckless rider, he made many attempts to break the enemy's line, but was struck and killed by a bullet. The Cossacks much lamented his death, afterward burning his body; when on the following day the Poles, aided by the Cossacks, won the battle against the Muscovites, they recaptured his horse and helmet and quarreled among themselves for the possession of his effects. These facts came to light through the testimony of Moses ben Joseph, who, in the name of eleven Jews who accompanied the army (probably as sutlers), testified in the case of Berachah's widow ("'agunah") before the rabbis. Joel Särkes ( ), Responsa No. 57.